CLEMSON, S.C. (AP) — Clemson coach Brad Brownell knows he has something many other programs don’t — a highly experienced backcourt to call on when things get tight. 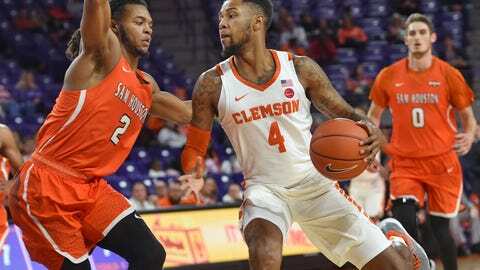 Marcquise Reed had a season-high 26 points and point guard Shelton Mitchell 13 as the 19th-ranked Tigers used a second-half surge to put away pesky Sam Houston State 74-59 on Wednesday night. Particularly during a 16-3 run midway through the second half as they combined for 11 points while Clemson took control. The Tigers opened 3-0 for the second straight season and for just the fifth time in coach Brad Brownell’s nine years. For a good while, though, it seemed the Bearkats of the Southland Conference were more than up to the challenge of handling an Atlantic Coast Conference opponent. RJ Smith’s 3-pointer early in the second half put Sam Houston State ahead 38-37 before Clemson’s back-breaking run. Reed scored seven straight points to start the run while Mitchell added a pair of baskets, one off a steal where he dribbled into an official before getting clear for the layup and a 53-41 lead. “I told him that was bad defense,” Brownell joked about Mitchell. The Bearkats (2-2) could not respond as Clemson eventually grew the margin to 16 points down the stretch. Both Reed and Mitchell explored their NBA options last spring before choosing a final college year. They’re each committed, Reed said, to an even bigger season than last year when the 25-win Tigers advanced to the Sweet 16. Reed said he and Mitchell know they’re the ones who must set the tone with Clemson’s younger players. Aamir Simms had 12 points and eight rebounds for Clemson. It was Reed’s second 20-point game of the season. Kai Mitchell led Sam Houston State with 14 points and Josh Delaney added 11. Clemson looked ready to blow things open early as it made its first six shots and led 15-7 five minutes in. But the Tigers went cold the rest of the half, and Sam Houston State took advantage. Clemson made just five of its final 18 shots of the opening half and the Bearkats took the lead, 30-29 on Albert Almanza’s four-point play with 43.8 seconds left when he got fouled by Elijah Thomas. But Clemson’s Mitchell answered with a long 3 20 seconds later to send the Tigers into the break up 32-30. Sam Houston State: The Bearkats have lost two in a row on the road. They showed an ability to hang with bigger Clemson for much of the game, but could not handle the Tigers’ experience in the backcourt with three-year starters in Reed and Mitchell. Clemson: The Tigers struggled to shoot consistently. Their defense, though, held up throughout the game as they limited Sam Houston State to less than 35 percent shooting with six steals and five blocks. Thomas has played through a difficult stretch. He was hurting from an ankle injury in the Tigers’ first two games and played against Sam Houston State despite being sick with the flu. Thomas had a 101-degree temperature Monday. He played 25 minutes Wednesday night with three points, five rebounds and two blocks. Sam Houston State coach Jason Hooten has not liked what he’s seen down the stretch in his team’s first two road games. The Bearkats had the lead in the second half at Louisiana Tech and at Clemson, yet lost both games. “There’s been a moment where we had chance to seize, I’m not going to say the game, but the lead. We’re not ready for that yet,” he said. Sam Houston State concludes its two-game swing at Power Five programs by going to Georgia on Friday night. Clemson plays Akron on Monday to start the Cayman Islands Classic.